A commentary on Michigan homeowner's shared septic system troubles, trials, and rules. 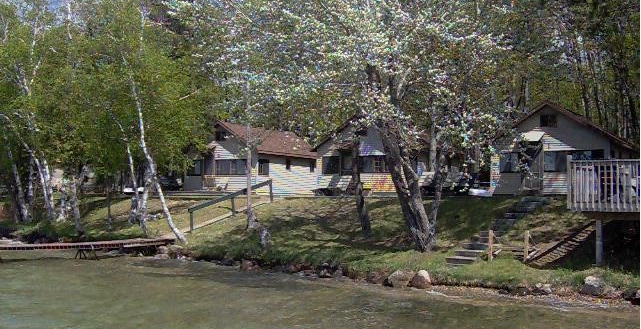 Over the years, many of Michigan’s former single owner, cottage-style resorts (you know, the mini-“resort” with cabins on the lake rented by the week) were divided up and sold as condominiums. Unfortunately, the shared septic systems between condo units were generally not addressed during the condominium conversion. If unchecked, a condominium owner or association may be responsible for separating or upgrading shared septic systems after a condominium unit is purchased. This has caught numerous condominium owners by surprise when repair or replacement of the systems was required. 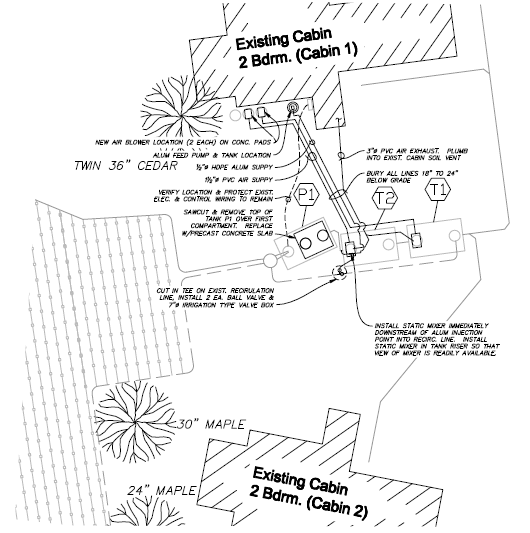 What if these cabins had shared septic systems? What's a Shared Septic System? A septic system used by two or more owners is considered by Michigan law to be a public system, even though a system may be privately owned. Public sewerage systems are governed by the Michigan Natural Resources and Environmental Protection Act (MNREPA, 1994 P.A. 451, as amended) in Part 22, Groundwater Protection; Part 31, Water Resources Protection; and Part 41, Sewerage Systems, the same rules that govern municipal sewage treatment works. These rules promulgated by the act were prepared and are administered by the Michigan Department of Environmental Quality (MDEQ). Conversely, individual septic systems are administered by local, county or district health departments. Because a two or more owner system is designated as a public system, the MDEQ has jurisdiction unless the local health department has an agreement with the MDEQ to administer public systems on its behalf. In general, a Part 22 groundwater discharge permit is not required from the MDEQ for sanitary sewerage systems if the average daily flow is less than 1,000 gallons per day (gpd) and the system meets the requirements of the local health department or the requirements described in the 1994 document “Michigan Criteria for Subsurface Sewage Disposal” (MCSSD) (Yes, its over 20 years old. Change at the speed of government...). These rules generally provide prerequisites of septic tank and drain field size. If the flow is more than 1,000 gpd but less than 6,000 gpd, the system is generally still exempt from a Part 22 permit but must meet local health department requirements and meet the requirements of the MCSSD. These rules work where favorable soil and groundwater conditions exist. Many condominium sites near the water have high groundwater or poor soil conditions and are at odds with the above requirements. These rules are better explained here. Michigan's MCSSD document requires that there be a minimum of four feet between the bottom of a disposal system and the seasonal high groundwater elevation. If this does not exist at the site, there is an alternative in that the Benzie-Leelanau District Health Department’s (BLDHD) sanitary code allows for disposal installation at less than four feet to groundwater if sewage is treated to a standard higher than required by the MCSSD, but unfortunately their code does not apply to condominium sites. That does not mean it can’t be done, it just means that the local health department has to get a sign-off from the State, and the State needs to accept the local health department’s advanced treatment criteria before they will acquiesce. Further, many if not most of these converted resorts are considered "site" condominium developments, meaning the individual condominium units are the parcels of land and everything on them (including the cabin that is so dear to you). Onsite sewage disposal at site condominium units, including shared septic systems, and any parcel of land that is smaller that one acre, are further regulated by the Land Division Act (1967 P.A. 288, as amended) via rules (Part 4) promulgated by the MDEQ and the Public Health Code Act (1978 P.A. 368). These rules require among other things, that septic systems are to be pre-approved prior to development of the condominium, but (more importantly in this discussion) allow that alternative methods of sewage treatment and disposal may be approved under certain circumstances. If you want to see the rules for themselves, or get a copy of the documents referenced here, go to the MDEQ Onsite Wastewater web page. 4. From the local MDEQ office, that you may receive a permit (Part 41) to install. Before you put your down payment on that cabin or cottage, be sure to ask the current owner about the septic system and where it is. A receipt for a recently pumped septic tank is not enough. Better yet, contact your local health department and ask them about the development and unit you’re considering. Get a copy of the original septic permit and ask them to explain it to you. They will likely have the information you need to determine if your future home-away-from-home has its own septic system or is part of a larger system, its age and its status. Would you buy a cottage if it had a shared septic system? If you have already committed to your dream spot, don’t worry. It’s not the end of the world; it’s just the septic system. If you have a good, working individual septic system, go put the little umbrella in your drink and sit and watch the waves (or whatever your fancy). As I said before, if you’re in a public (or shared septic) system and the system is working well, Big Brother shouldn’t be knocking on your door anytime soon (unless, of course, things change. I had to add that. Lawyers, you know). You and your condominium neighbors should, however, acknowledge the fact, plan for costs of maintenance and/or upgrade, and create a reserve fund for when that time comes. It’ll benefit you in the long run and help to keep your resale value up as more and more purchasers follow the advice in the paragraph above. **The rest of the line in Sir Walter Scott’s poem, “…when we first practice to deceive”, is not, I hope, what our dear legislature had in mind when these rules were developed (although I know that the rules were developed over many years and legislative sessions by different elected officials in office at different times).